Mt. Saijo (妻女山) is the mountain located in Nagano. It is one of the Kawanakajima Historic Battlefield. This is the mountain where Uesugi Kenshin ( 上杉謙) of Echigo and his troops were based for the fourth Battle of Kawanakajima, on September 10, 1561. 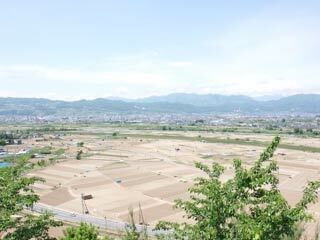 There is an observatory where you can see all Kawanakajima area and beautiful Kita Alps. On the night before (sept. 9), Kenshin had spied smoke rising from Kaizu Castle and upon further inspection witnessed Takeda Shingen's army's preparations for battle. He then led his troops down the mountain and across the Chikuma and Sai River to Hachiman Field in a drive for the enemy, "making the sound of whips." At the gateway to the mountain's observations area is the "Spear-Struck Fountain." Legends say that in the place where Kenshin jabbed the sheath of his spear a fountain appeared. A commemorative stone marks the spot.